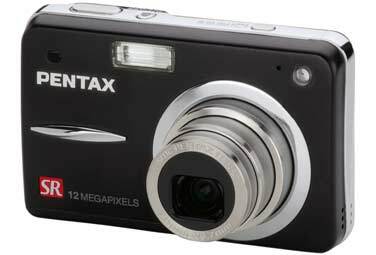 Pentax’s Optio A40 is a 12-megapixel compact point and shoot digital camera. It offers digital and optical shake reduction, as well as high ISO settings and a 3x optical zoom. It’s also capable of recording videos at 640-by-480 resolution at 30 frames per second in DivX-based MPEG-4 format, which requires the installation on your Mac of a free software plug-in. Fitting easily into a shirt pocket, the diminutive black and silver Optio A40 feels sturdy and well constructed. It lacks an optical viewfinder, which is handy for shooting in bright conditions, but the Optio A40’s 2.5-inch LCD, which just about takes up the whole back of this compact camera, is bright enough to get you through most situations. The Optio A40 has a number of interesting features that are supposed to make easy work of difficult shots. For example, the camera has modes for shooting documents, for night portraits, and more; my favorite is the easy-to-access reduced flash mode. 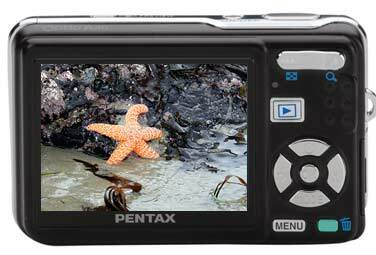 Pentax boasts of an enhanced shake reduction feature that takes advantage of the camera’s built-in digital and optical motion compensation. Both of these features were helpful in capturing photos of my kids during testing. The included rechargeable lithium ion battery yielded 760 shots in our battery tests. The camera also performed well in our photo image quality tests, able to capture lots of small detail when we shot a resolution target. The camera was also able to capture clear, sharp images of our still life with pleasing color, with and without the flash. In fact, it was difficult to tell the difference between images taken in low lighting with flash and shots taken with studio lighting and no flash; often times invoking the flash will cause drastic color shifts or blow out the center of the scene. Back of the Optio A40. The DivX movies were of Good quality, though it’s preferable to have a camera that shoots video in a format natively recognized by the Mac. To watch the movies, you can download the free DivX software player, or you can download Perian and play the movies in QuickTime. To import the DivX videos into iMovie ‘08, you must convert the video into a compatible format using the free ffmpegx software. There’s also a problem with the bundled software CD that prevents the included ACDSee photo management program from installing. A call to Pentax’s tech support can get you a free replacement CD, but the software isn’t worth the hassle. Stick with iPhoto. If you consider just the camera itself, Pentax’s Optio A40 is a good all-around performer. It’s small and sturdy enough to take anywhere, and it has Very Good image quality and shooting modes that make taking pictures a breeze. Viewing the DivX-encoded movies could be simpler, but for those looking for an easy to use, pocket-sized camera, the Optio A40 is worth checking out.